The Velux TGR 010 1000 Sun Tunnel Tubular Skylights with Pitched Flashing and Rigid Tunnel and Low-Profile Flashing are designed to make your housing space brighter with energy-efficient and natural light. The Velux TGR skylights are the best to install in rooms with flat ceilings: bathrooms, closets, and hallways. The Velux TGR 010 1000 skylight has a highly reflective rigid tunnel that provides brighter, whiter light output in any application. 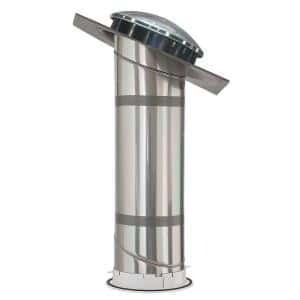 The Sun Tunnel Tubular Skylight is the best for installations that need longer tunnel lengths. The original one-piece low profile metal flashing is parallel and blends into the roofline. Maximum roof pitch (degrees) 60 in. Minimum roof pitch (degrees) 14 in. Rough Opening Height 10 in.